If you are considering Dolphin Smart Community Builder, online dating, communities and social network for your site, this article could be a good job. With Dolphin, one can discover blogs, photos, videos, music, groups, classifieds, events, polls, forums, articles, boards, chat and a lot other features. This article features a complete visual guide on installing Dolphin Smart Community Builder by Boonex. If your host is Bluehost and you have encountered errors on early stage of installing Dolphin, here’s the solution followed by installation guide. Is your browser displaying this error, during first execution of Dolphin? Personally, I searched and spent a considerable amount of my busiest hours on the net to solve this problem but could not found a proper solution. All so called helpful forums and communities could not solve my problem, later I discover that most of them were misleading, yes totally misleading. According to them, Bluehost won’t allow customer’s quiry on solving such problems and a lot about such things. Me, too, followed them but at last I talked to them about my problem. Finally, they did an appreciable piece of work. The Dolphin guidelines on Things to Know states that either php.ini file or .htaccess file need to be modified according to server running in CGI or Apache mode. My server was running in .htaccess mode but actually I had to change php.ini to resolve the conflict of the above screen casted problem. 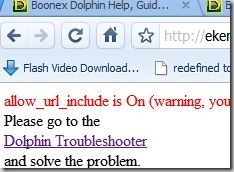 Detailed installation instructions in Dolphin support page could do no better than contacting Support Guys at Bluehost. So, personally experiencing with Bluehost, you can ask them to help you; I believe they will. You might be interested to read: .htaccess tutorial or step by step visual guide to installing Dolphin after this article.